Along with running a business comes a number of day–to–day tasks, projects and activities that must be accomplished in a timely manner in order for the company to thrive and grow. The last thing on anyone’s mind is whether or not the commercial HVAC is working properly. But when it does act up it can affect the people who work for you and the people who are potential customers, which is a bad result no matter how you look at it. Thus it is imperative for an efficiently run company to have a commercial heating and air conditioning system that works properly no matter what time of year it is in Coeur d’Alene. ACI Northwest is here to assist with this exact need in providing quality services on commercial HVAC systems in Spokane, and we continually strive to offer the exact HVAC services which our commercial clients need. Ready? Schedule a service now. 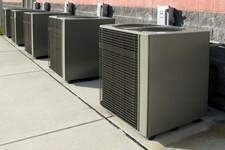 Commercial heating and air conditioning systems are much larger and more complex than smaller residential units. Because of this there are the different variables which must be addressed when ensuring that any commercial building has commercial HVAC that is working as efficiently as it is expected to. HVAC technicians that work on commercial heating and air conditioning systems must have a higher level of expertise, specifically within the commercial field, in order to make certain that they are giving the highest quality service possible to commercial clientele. ACI Northwest is a fully licensed commercial services company with many years of practical experience working with various kinds of heating, air conditioning and energy management systems. We are trained to cover everything from commercial HVAC systems to commercial rooftop units, commercial packaged air conditioner units, commercial boilers, chillers, and energy management systems. We are a licensed commercial heating and air conditioning services company that offers quality commercial HVAC services all over Coeur d’Alene Idaho, Spokane Washington, and surrounding areas. We handle everything from complete HVAC system installation and replacement to air conditioner repairs and preventive heater maintenance programs. Contact ACI Northwest and work with a professional commercial HVAC company that will perform professional commercial heating and air conditioning services every time.